The library can be installed with pip. Upload your part as an .obj file either using a post request or our interface provided here. The sample file for this tutorial is provided on GitHub. 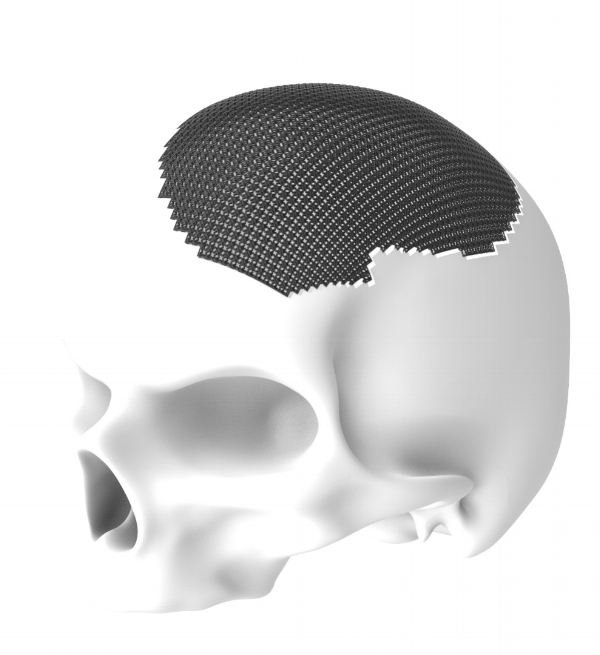 First we will create a lattice function that we can array across the surface of the implant. The lattice function inputs look like this. Case: Is an integer value between 0 - 7, defining different type of lattice units. Chamfer: Is a float value between 0 to 0.5 defining the angle of chamfer of the corners. Center Chamfer: Is a float value between 0 to 0.5 defining the angle of chamfer from the center. Bendln: Is a float value between 0 and 1, defining angle bend of the lines. cBendln: Is a float value between 0 and 1,defining the central bend of the lines. Connect Pt: Is a float value between 0 and 1, defining the connection points. Then we set all the necessary variables and generate the lattice. The lattice will be saved on the server as “implant.obj” and you can access it when you are ready. The lattice will be only lines so you will need to generate a mesh if you want to print it. You will generate the mesh with this function and store them in a variable called final so you can download them later. Now we want to generate a new lattice with a gradient. We will need to create a new lattice unit to blend into that is “topologically equivalent” (from the same case number) and set up variables that you will use for the attractor. The final code for this tutorial looks like this.